Is Pinterest of any use for my boring business? Having managed client Pinterest boards for almost twelve months I have developed an understanding of why Pinterest is a social media platform that business should not ignore. Skype training sessions I have held show there is much uncertainty and insecurity about just what Pinterest can do for a business. [Tweet “Pinterest for business 2014 are you ready?”] Here are a few things that might help. Like every social media platform Pinterest works better for some brands and not so well for others. Look at your brand’s profile. Who do you want to sell to and what kind of product, brand or service are you wishing to promote? Do not dismiss this platform because you think your service is too boring to pin. We don’t produce images, we sell social media management platforms you might be saying. That’s fine but you can build your Pinterest persona around attracting the kind of people who might just want to manage social media. With imagination and care Pinterest for business 2014 will be the right thing for your company to undertake. 1. Ensure Your Profile Sells Your Brand. Take the example of Leadamo. They are a brand new entrant to the platform and yes, they are extremely tedious (sorry guys!) but we had fun with their name and found board titles that would exploit it: ‘Lead a More extraordinary Life’ – Lead a More-ish but Clean Diet’ -‘Lead a Monster Pinterest Campaign’. This demonstrates hopefully that Leadamo have a sense of humour and their ethics revolve around being different, social media and healthy eating! [Tweet “Pinterest can help you personalise your brand.”] When you have your boards designed on paper then the work begins. 2. Write your profile like you mean it. This really is a subset of point 1. People will investigate you. Pinterest works in such a way that you are notified in a little box on the top right of your home page telling you who has pinned, liked and followed. Check these people out too. It might lead to nothing but if they are intrigued by your profile then they may click onto your website. Ensure your website address is prominent in the description on each board too as appropriate. Ensure you join Pinterest using your business name and set up a business account which will have Pinterest’s analytics attached. [Tweet “You only have a millisecond to make an impact.”] Employ someone with content writing skills to write or check your profile if you want Pinterest for business 2014 stylee to work for you. Landed House using Pinterest for business 20143. Create an aspirational lifestyle for your brand. if you look at Landed Houses who advertise splendid country homes for exclusive use then you will see their boards mirror their style. There are titles such as ‘A touch of Traditional British’ ‘Look Good for a Country House Celebration’, ‘Country Kitchens’ ‘Downton House style weddings’ etc. Their pins are beautiful and aim to create an atmosphere of history, tradition, class and evoke longing for the UK countryside. You will find references to Hunter wellies, Barbour waxed jackets, Champagne etc. They have firmly identified their niche and target audience. 4. Your brand should position itself right in the middle of your boards. The additional associations serve to amplify your brand’s positioning. Align yourself to similar products or complementary ones. In real life certain towns and quarters are well known for their antique shops, specialist foods, tattoo parlours, bookshops, ethnicity and so on. You can recreate this on Pinterest. Make contact with other sellers in your niche and ‘trade’ pins. You can but try. 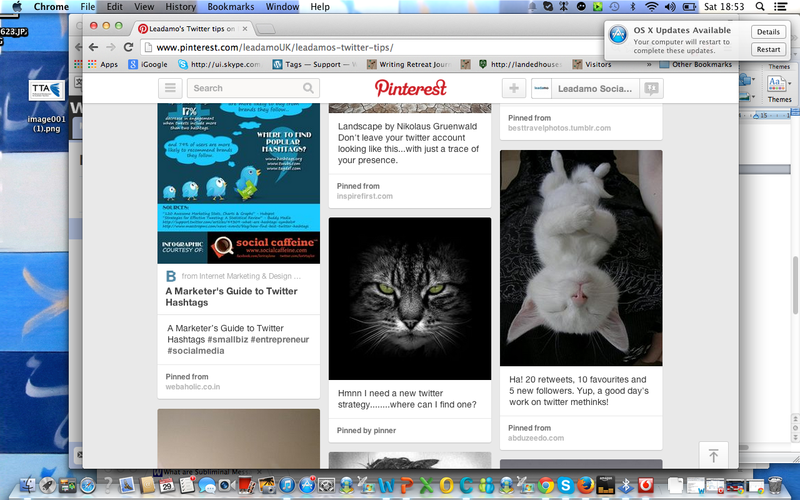 [Tweet “By commenting on people’s pins it’s possible to strike up professional relationships”]. You might even end up with a guest post! Just do it with good grace, subtlety and friendliness. 5. Making use of group boards. You know something is a group board as its symbol is three grey silhouetted heads. You might be invited to join: do it. You could also invite other people you follow or who follow you to join one of your boards. You will find that a popular group board will drive plenty of traffic and pins. It will get your name known to many people very quickly. 6. Don’t be afraid to use subtle calls to action but be aware of Pinterest etiquette. No one wants to be ‘sold’ to in the conventional manner; that’s why they love Pinterest. Do not flout this as people will soon complain. But if a pin links beautifully to a blog post there is nothing wrong with asking people if they would like to read more. Just add a link at the end of your comment or description. 7. If you choose to follow particular types of pinners you will quickly create quite a community. Hubspot recently confessed on a webinar that keyword phrases such as social media were too competitive. But their research showed that people in this niche have a passion for cycling (!) so they made use of this to reach their target audience. Leadamo too decided that anyone wanting social media management was probably someone who was tech savvy and looking for solutions. They are often outliers and people looking for something new. All this impacts on the concept of an ideal customer; you should have one in your mind. A gadgets board, for example, would be an ideal Pinterest temptation or fishing net as I like to think of it. 8. You can create the most amazing target audience profiles and really get to understand buyers. For example one pinner had a board entitled 1954 vintage. Yes that was a date of birth. Straight away you have valuable information for a potential marketing campaign. She added a location, a board on dieting, shoes, exercising and cup cakes. Can you see, we are already building up some valuable insights into this woman (we know she is unless she is lying lol! )If you have the time and energy, [Tweet “the data mining that can happen on Pinterest is extraordinary”]. I will continue this theme in another post. That’s enough to be going on with isn’t it? 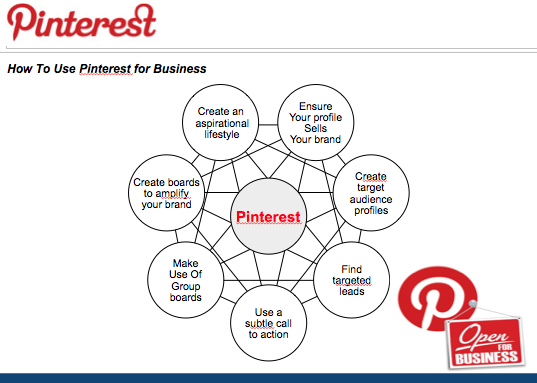 With an imaginative approach Pinterest for business 2014 will make a difference. If you need Pinterest board management or Pinterest advice please click here. If you found this of use please share and help others who might benefit!